If you see what appears to be an unbeatable hand then your gut instinct will take over quickly. Do not get caught up in the rush of excitement that is going on inside of you. There are several good ways for you to handle yourself in these sticky situations. Proven methods that will help you to make the right bet. Learn how you can optimize your playing time and give yourself the ability to win, even when your hand is complicated at best. Tricky bets can trip you up in USA Poker, but there are ways for you to be prepared for them. You can know some more and use some triks playing the game! If you are playing poker in a no limit tournament then you will have to stay focused. Let’s say that you are seating in the dealer button position at the table, and you just flopped a flush. Your heart is probably beating hard and fast at this point in the hand. You might think that this is a no brainer when it comes to your bet, but you would be mistaken. You need to look not just at your great hand, but the other cards that are out there on the table. Think about your flush. Is it large or small? If you have a flush that consist of an ace, then you are probably seating in the drivers seat. However if you have a flush where the high card is a 10, then their are, four cards out there that could sink your great hand. You also will have to look at the cards that are on the table in front of you. How many of the cards that are face up are the same suit? This is a good question to ask yourself before you bet, because they are community cards that will be used by the other players to. If there is four cards of the same suit on the table then other players may have the same flush that you do, but with a higher card. This is why they call it a tricky bet. Just because the hand looks really good on the surface, you can not stop there. The next time that you are dealt a good hand tries to raise in stead of just calling. If you are too afraid to rise then you might find yourself in a very bad position. Over calling is one of the worst tricky bets that there is, in the game of poker. 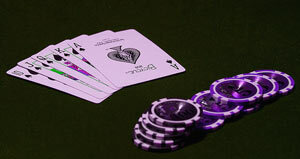 If you are calling almost every hand that you are playing then you are bound to get bluffed out of the hands to come. Players will pick up on it and use it against you. It gives the appearance that you are scared, and weak in your playing style. While aggressive players tend to overcompensate in other ways, by calling often you are setting yourself up for heartbreak to. You never want to appear weak to poker players, because they will eat you for dinner. They are cunning and savvy, and will take you out of the poker game, if you let them. Another thing that you have to be careful of is what you do if the player that acts in front of you checks to you. If you have a good hand then you should try to raise versus just calling. If they are weak they will be likely to fold. If they choose to call or come over the top of your bet, then you should use caution. Most of the experienced players will only use this bet if they can back it up. They are usually just trying to appear weak, so that the other players at the table will do their betting for them.